Autumn brings a wealth of wonderful produce – including the fantastic persimmon! 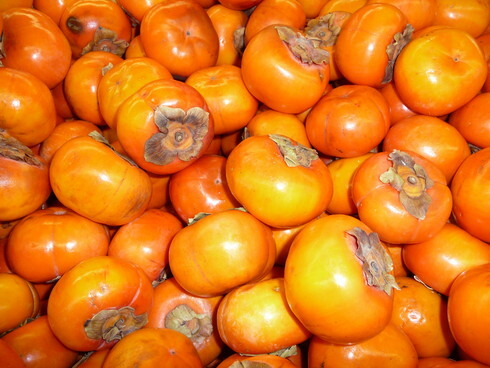 In California, we can find two varieties of persimmons at the local markets – the hachiya and the fuyu. These two varieties represent astringent (hachiya) and non-astringent (fuyu) persimmons. Hachiya persimmons, which are pointed on the end, are astringent until they ripen. They turn deep orange in color when they are starting to ripen. However, don’t be fooled by color alone. They are ready to eat only when they become jelly-soft (like a water balloon). Note: You can buy fruit that is still a bit firm and ripen it in a bowl with a banana or an apple. I have a hachiya persimmon tree in my yard and it has a lot of fruit on it this year. I have really enjoyed coming up with new recipes that use these delicious fruits. Take a look at my Moist Persimmon Cake with Creme Fraiche recipe, as well as my Persimmon Scones recipe. Fuyu persimmons (pictured above) are flatter than hachiyas and can be eaten while still firm or soft. I think they are best when crisp and sweet. They should be peeled before being eaten, as the peel is astringent. Add them to a salad for a real treat. Take a look at my recipe for Autum Salad with Fuyu Persimmons, Candied Pistachio Nuts, Fresh Goat Cheese and Honey-Vinaigrette Dressing.